I read Jezebel. I know, shocking right? So I have been well aware of the buzz around Obvious Child. It was definitely on my “to see” list but I expected to wait a really long time to see it. 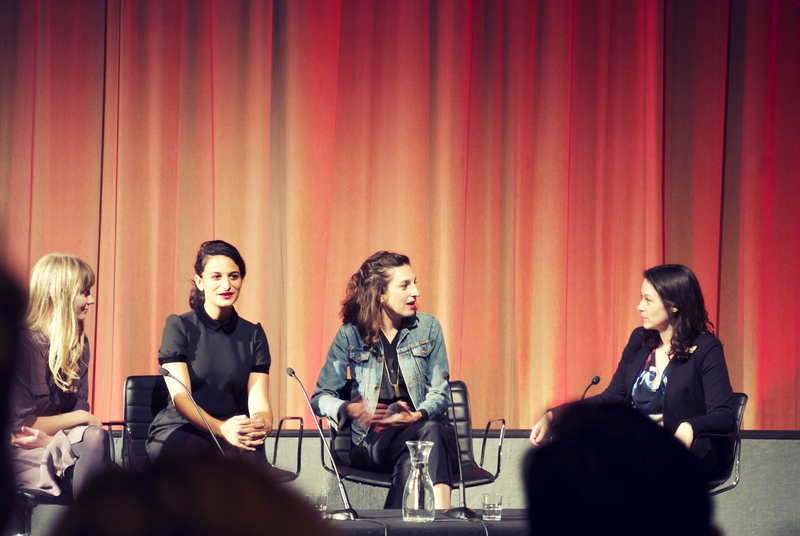 However after my visit to the BFI a couple of weeks ago, I noticed that they were not only showing the film but holding a Q&A with the writer/director Gillian Robespierre, writer Karen Maine and star Jenny Slate. I immediately texted Tim and we booked the heck out of it. And last night we saw it. I have been thinking about this film pretty much since the minute it ended. Something about it really touched me and I desperately want to see it again. This film is important, which is not to say that it has an agenda as Gillian pointed out in the Q&A, but it is important. It shows a real woman making a real decision without judgment or disastrous consequences. We’ve been fed these silly nonsense rom-coms for such a long time and it was a welcome relief to watch a film so unapologetic in its portrayal of women, of relationships, of life in general. I had reservations before I went in because I thought it might be a bit heavy handed, but actually this film isn’t about abortion at all. It’s about Donna, a stand-up comedian who is having a bit of a hard time at the beginning of the film. Then she meets Max, played by Jake Lacy who will forever be known as Plop to me because of his character in the American Office. I adored Max with his slip on shoes and cute scarf, but it was so nice that he wasn’t just one thing – he was just as funny as Donna and although you could tell that they weren’t each other’s type, you rooted for them anyway. And then she gets pregnant, and then she decides to have an abortion. That’s it – no big dramatic decision making, no family trying to convince her otherwise. This isn’t Knocked Up or Juno, and thank god for that. Donna makes a decision that women make every day, and you really get the sense at the end of the film that her world hasn’t collapsed. The Q&A at the end of the film was great, and there were some lovely insightful questions asked. Tim noted that it’s probably the only film Q&A he’s been to where audience members cried on two separate occasions, and I got teary myself when Jenny Slate told of the awful things people have been tweeting her. People are horrible. Fortunately, there were no stupid protests this evening – just a lot of love from a very blissful, sated audience. One thing Gillian said that struck me was that she wrote a film about a woman, not about a decision, and everyone was keen to stress that this is just one experience. The film isn’t saying all women should have abortions or that abortions are super fun, and I think that’s what has disappointed me so much about reviews and comments. I always read other opinions after I see a film – love it or hate it. Trying to validate my own feelings I guess. Reading the Guardian’s review this morning, it was so sad to see the comments descend into an abortion debate with people citing Roe V. Wade or religious beliefs. Inevitable I suppose, but such a shame – why can’t they just appreciate this warm, moving, funny film. The truly amazing chemistry between Jenny Slate and Plop/Jake Lacy, the touching scene between Jenny and Polly Draper. I could gush about this film all night. I was also really surprised by Jenny Slate. There was one scene in the film where she completely broke my heart. It was so subtle, so beautiful, and something I wasn’t expecting from the woman behind Mona-Lisa Saperstein. She was incredibly charming in the Q&A and extraordinarily pretty as you can see from my photo above. I have developed such a crush on her, so much so that when she favourited a tweet of mine last night after the film, I got so giddy I almost missed my stop. See this film. See this film because if you don’t, we have no one to blame but ourselves when they continue to make films ‘for women’ which are utter crap. And that will truly make me sad.